I wanted to use this idea for Debbiedoo's copycat party earlier this week but the frame had to be re-glued, and I didn't get it ready in time. The frame is from an old country sign my Mom gave me. 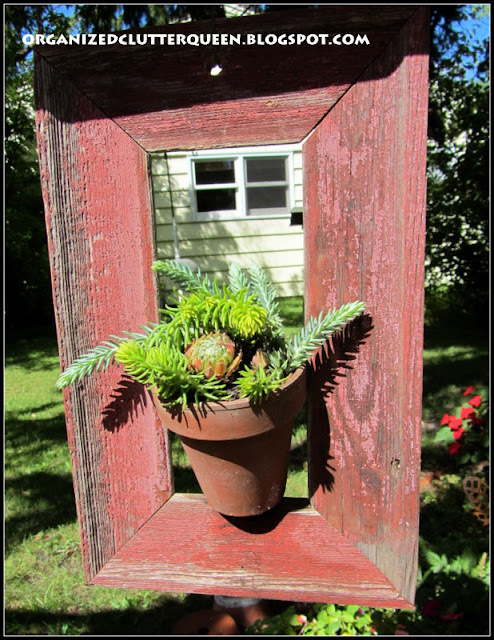 I threw the sign part away and copied Stephanie Lynn's (Under the Table and Dreaming) framed pot of sedums. My pot has Angelina sedum, Blue Spruce sedum and hen and chicks. A nail in the frame holds the pot in place. This is my inspiration! I think these are Angelina sedum. 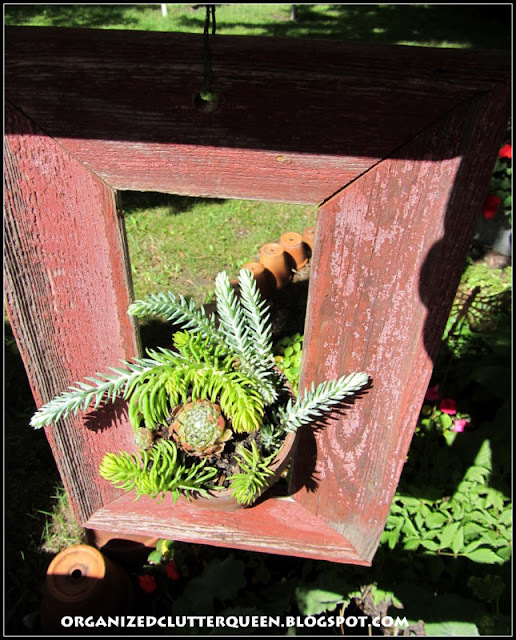 This is outdoor vignette that I blogged about in Today's Garden Junk! 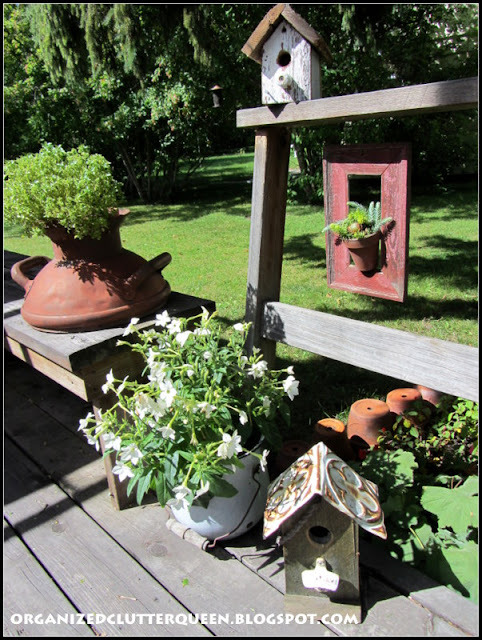 I just moved the bird houses, the white enamelware pot with a nicotiana, and the milk can top with boxwood basil to join my new frame. So cute Carlene. Darn, I just gave me daughter a red (almsot identical in color to yours) wormwood frame that I have had for years. It would have been so cute to do something similar. I love how the entire outdoor vignette turned out. Loving your garden vignette. and love the pot in the frame. 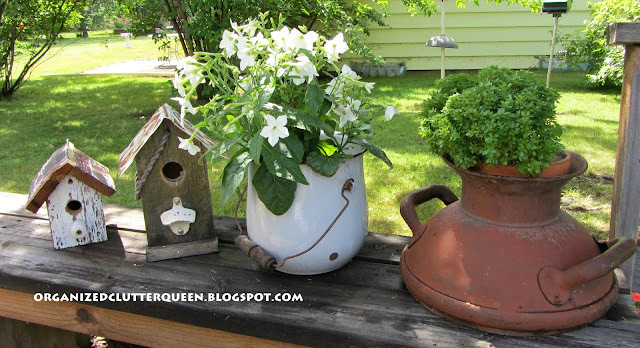 I also love milk can top planter, so cool. I have a milk can out in the yard and I'll be putting a plant in it soon. The old frame is such a pretty chippy color, and love how you hung in below, such a cute vignette! So glad you shared your creative inspiration with Sunday’s Best – your creativity helped make the party a success! 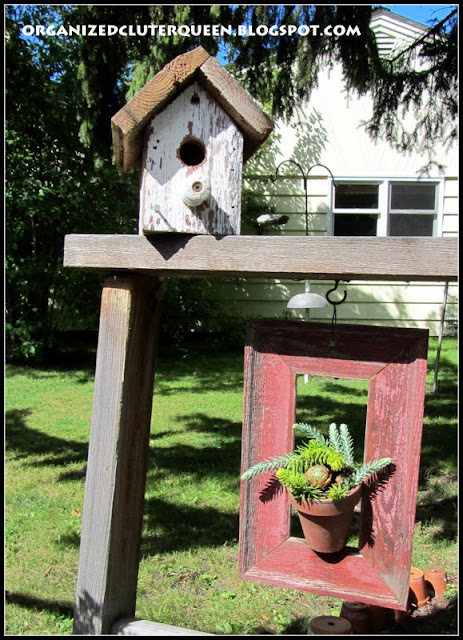 Your birdhouses are adorable. 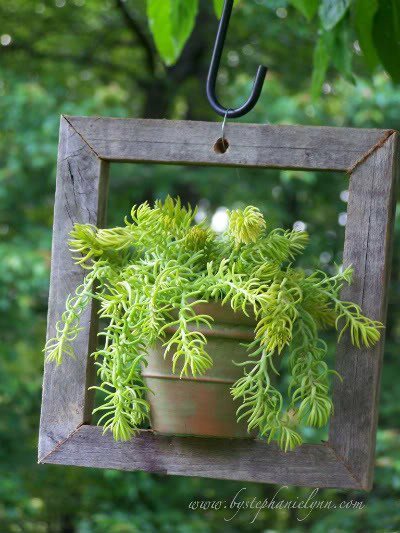 I love the idea of using a frame around a potted plant, really makes it look special. Thanks for sharing. 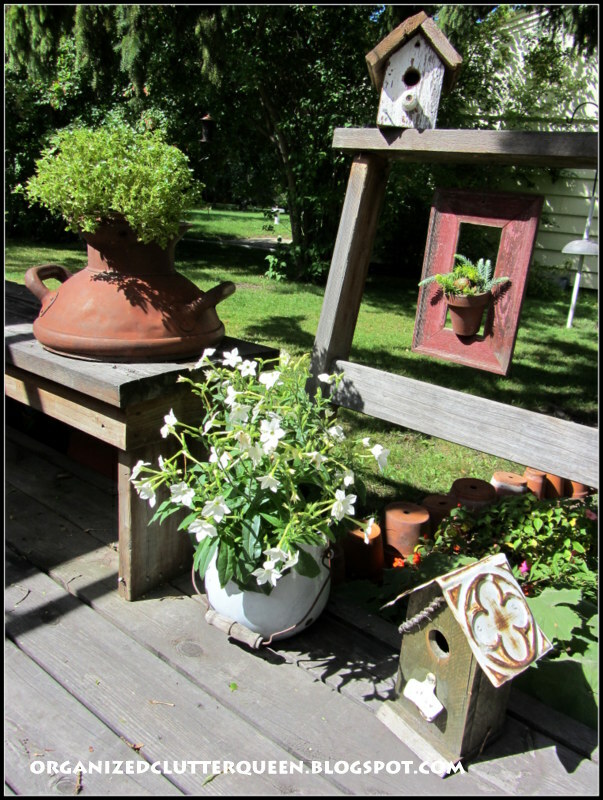 Love your garden vignette! Your red framed succulent is beautiful. Came over from Charmer to see your garden vignette. You did an excellent job of copy-catting. Love the red frame - don't know that I could put it outside. I really get excited when I see someone who plants in every imaginable thing like I do. I do not like the look of everything in matching pots. Cute! I love the the look of the plant in that old red frame! I love vintage in the garden...yours is wonderful! Love this idea! Very cute the whole vignette! would love if you would share it over at my Share it One More Thttp://www.onemoretimeevents.com/2012/08/features-and-share-it-one-more-time.htmlime party. Hope to see you there. I just found you and now following linky. You really do have some great ideas! I'm loving that little frame, too--as well as the vignette. You always have the best ideas! Love it! Pinned it! Gonna copy it! i love that, and that plant is so neat! Nice to meet you,visiting your blog has been a pleasure.I love your Paragon tea Cup ,It´s really charming! What pretty yard art! I love the idea you have shared here with the frame and potted plants...it looks really great in your yard. Beautiful!! I love all your pieces, the bird houses and the frames and potted plants, which I love, casue I have some indoors and make a home so warm. Your yard is lovely too. Thank you for dropping by to visit. Enjoy your week. Carlene, that all looks really cute. I haven't seen the picture frame idea before and I like the way you decorated around it. Love the pot in the hanging frame ... must copy that. Came by from bj's "Sweet Nothings" posting on potting tables and just love your collection of watering can on your potting bench. Blessings,Audrey Z. @ Timeless Treasures. Lovely! I love that old enamel bucket. Nice to meet you Carlene. I love your name. The sweet vignette of bird houses and planters....I love them. Visiting over from Outdoor Wednesday. Great job on your copycat frame. I love the red, and the natural look. Your flowers and plants are gorgeous. Such creativity. All are so well presented. How cute is that!!! I love succulents. I have a strawberry pot succulent garden, with a different variety in every hole. Thanks for sharing your great idea! Hope you can stop by my blog sometime, and if you have not already done so, "Like" Hood Photography on Facebook! Thanks! What a lovely post this week. See you next Wednesday. What a beautiful arrangement you have to enjoy! I love all the interesting old elements. Great job! Calling by as another participant from Outdoor Wednesday I just love your ideas, makes the garden seem more personal! What a perfect blending of art and nature.......I could never think of something like that....thank goodness there's you to show me how! 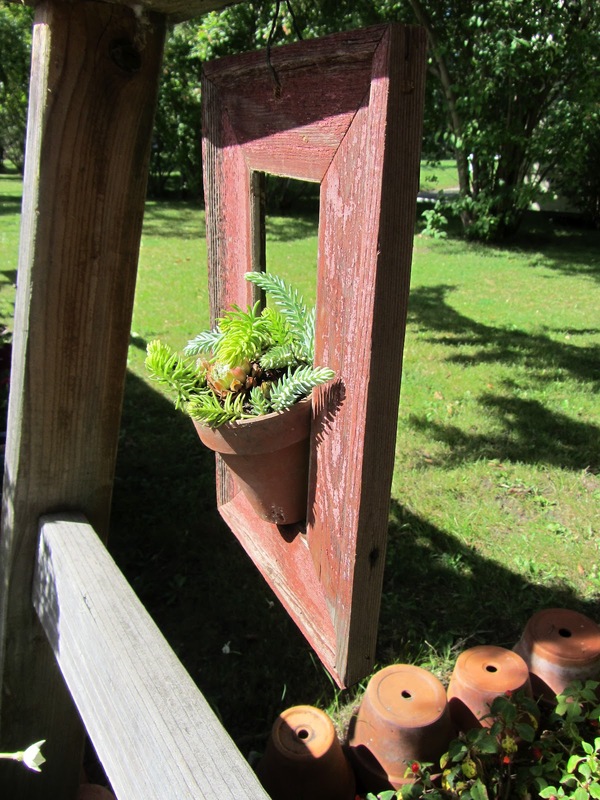 Your garden pot frame and all the other great "art" in your garden makes it so interesting! 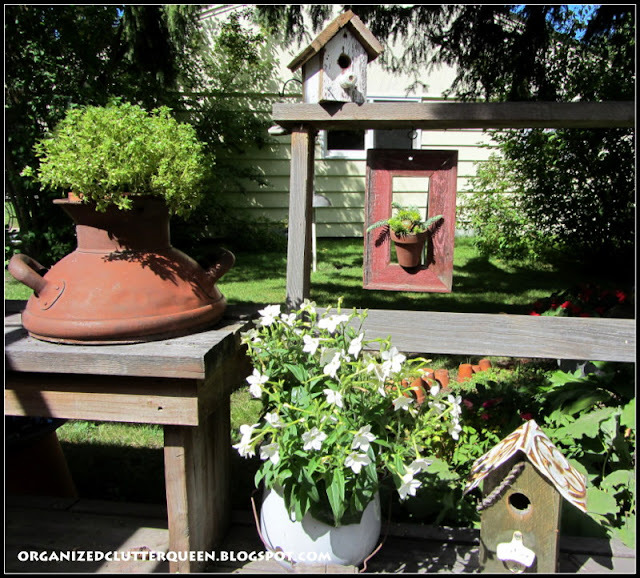 Thanks for joining us at TUTORIAL TIPS AND TIDBITS with your fun garden vignette tips! The perfect plant for your weathered barnwood frame. Cute! Hi, Carlene...I am LOVIN' all this great garden art. Just adorable. Now, I will be looking for more cute containers to plant things in. That frame idea is genius. Very pretty and whimsical! I love sedums. Your succulent frame turned out great and I've got this linked to my DIY succulents roundup post too today!